Traveling during the winter often is dangerous and not at all enjoyable. If one is flying, it could be that the desired flight1 will be cancelled2 or so late that connecting flights3 will be missed. When we are flying some place we try our best to avoid flying through the Denver4 airport because we have missed a number of connections5 there over the years. In fact, we were told by a pilot that Denver has about the worst weather of any U.S. airport. Traveling by car can be dangerous and unpleasant too. The week before Christmas, we drove to Kansas to visit some of Don’s relatives. I was skeptical6 about going because the long-range weather forecasts7 were for bad weather, but Don wanted to go so badly that I agreed. On the Thursday before Christmas, the trip down to southern Kansas was fine, as was the weather. We had good visits with Don’s brother and his wife, his nephew Robb8 who lives in that area, and his nephew John from New York. John and his wife Linda came on Saturday with the idea of driving on to Kansas City9 that night to visit with Linda’s mother. By the time they got to Don’s brother’s house, the weather forecast of bad weather that day had turned out to be true and we had a heavy snow storm with a lot of wind. Of course, they were smart enough not to go on further that night, so we had a really nice visit with them. Fortunately, during the night the snow stopped. We discovered that the windows of our car were ice covered and it took quite a while to get them cleaned off. We have metal studded snow tires10 so were able to leave all right, though the country road wasn’t in very good condition. The roads weren’t bad at all until we got north of Kansas City. The highway from there to Des Moines (over 200 miles) was icy. We saw over 50 cars that had slid off11 the highway. Some were upside down, some on their side, and still others stuck in snow drifts12 at the side of the road. I did quite a bit of the driving during that part of the trip and I clenched13 my hands so tightly around the steering wheel14 that they hurt for two days after that. Don drove on to Pella from Des Moines and we saw about 12 cars in the ditch in that 30 mile area. When we got home, we were truly thankful to be home and both of us were tired throughout Christmas Eve and Christmas Day. Both days were nice. We celebrated with family and friends here, and I was thankful that we had made it home15 all right so that we could do so16. 1. desired flight: flight that someone wants or hopes to have (很想乘的航班). 2. cancelled: eliminated or deleted from a schedule of events or activities (取消). 3. connecting flights: travels which make transfers possible at given airports, and which involve a change of aircraft involved (续程航班，旅途中转机). 6. skeptical: doubtful, or having reservation about something (表示怀疑/疑惑的). 7. long range weather forecasts: the prediction of the weather for at least several days in the future (数日/一周天气预报). 8. nephew: the son of one’s brother or sister (侄儿/外甥). 10. metal studded snow tires: car or truck tires which have very hard steel inserts into the tread of the tire (有金属钉的下雪用轮胎，轮胎花纹里嵌有很硬的钢钉). These give better traction than regular tires in conditions including ice, snow and rain. 11. slid off: left the roadway because of slick, snowy or icy conditions which made them lose control of their vehicle (滑出去). 12. snow drifts: piles of snow blown into piles or areas by the force of wind (吹积的雪堆). 13. clenched: held or closed tightly (握紧). 15. made it home: (idiom) succeeded in getting home when this is difficult (顺利到家). 16. we could do so: we could celebrate with family and friends here. Who was Sinterklaas? Let me tell you. A good man, Saint Nicholas6, (later known as Sinterklaas) lived from 271 to December 6, 342 AD in Myraa, Asia Minor7. He became the patron saint8 of fishermen and as a priest was known for good deeds9 all through the Mediterranean area10. He is the patron saint of Amsterdam11. As Dutch trade12 grew, so grew the tradition13 of Sinterklaas. Traditionally, Sinterklaas arrives by boat from Spain and rides through the streets on a white horse. He is accompanied by a Moorish servant14, Piet, and many helpers. Sinterklaas listens at chimneys15 to check children’s behavior16. Wooden shoes17 are left by the fireplace18 with carrots or hay19 for the horse. Piet exchanges20 this for a small gift of candy. Sinterklaas Eve21, December 5 and Sinterklaas Day, December 6, are days of festivity22 and merriment23. Sinterklaas parties consist of jokes, rhymes24 simple gifts, and lots of festive fun and laughter. Traditional spice cookies25, hot chocolate26, and Dutch donuts27 are served. Big pieces of Dutch chocolate in the shape of letters are also given. In Pella there is usually a parade28 with Sinterklaas arriving on a big float29 made like a boat. Children dressed in Christmas costumes30 follow the float. Our eight year old granddaughter Cassie loves to come for the Sinterklaas festivities and did so again this year. Kim made her a costume for the parade, a snowman31 costume. She really looked cute in it. Unfortunately it was a very, very cold day so the people in charge cancelled32 the parade, saying it was too cold for little children to march33. Cassie was terribly disappointed but she got to wear her costume anyway to the breakfast party at 10:00. At the party we ate Dutch pastries34, which Cassie liked very much. Each person was also given a little pottery windmill35. After the breakfast party we all walked to the Pella Opera House36, where there was a program of Dutch songs and a story. Then Sinterklaas read the name of each child there, announced37 a good deed38 the child had done (provided by parents or grandparents), and gave the child a big chocolate letter “S.” As we left the Opera House each child received a big spice cookie. Cassie and I had a wonderful morning, even though she was disappointed about the parade. 2. Dutch: (of) people from the Netherlands, a western European country (荷兰人，荷兰人的). 3. Sinterklaas Day: the day in Holland in honor of Saint Nicholas (荷兰的圣尼古拉节). 5. participate: be part of an activity or action, take part in an event (参加). 6. Saint Nicholas: the name of the patron saint who in the western tradition was known for his good deeds and kindness to children (圣尼古拉，是西方传说中的守护神，他对孩子非常仁慈，做了很多善事). 7. Asia Minor: the peninsular part of Asia between the Black Sea, the Mediterranean Sea and the Aegean Sea, comprising an area now known as Turkey (小亚细亚，位于黑海，地中海和爱琴海之间，是土耳其所在地). 8. patron saint: the name given to the saint who is the “protector,” guardian or fatherly religious leader of a specific group of people (守护神). 9. good deeds: something good done by a person or group of people (善事，好事). 10. Mediterranean area: the land bordering on the Mediterranean Sea (地中海地区). 11. Amsterdam: an important sea port and commercial city of Holland (阿姆斯特丹，荷兰的海港和商业城市). 12. trade: commercial activity (贸易). 13. tradition: a practice based on a historical past event or an important activity (传统). 14. a Moorish servant: 摩尔人仆人。The word “Moorish” comes from the Moors, a group of Arabic people who were the conquerors of Spain and controlled the southern part of the country between the 8th and 15th centuries. 17. wooden shoes: shoes made of wood which were characteristic of workers in Holland where dampness and mud were common in working places (荷兰木鞋，穿这种木鞋是荷兰工人的特色，因为那儿的工作场地潮湿多泥。). 19. hay: the dried grass stem of plants such as wheat, alfalfa, etc. used for feeding animals. 22. festivity: a joyful or gay activity (欢庆活动). 23. merriment: laughter, fun, and enjoyment (欢笑)..
25. spice cookies: traditional Dutch pastries made with traditional Dutch spices (香味小甜饼，用传统的荷兰香料做的传统荷兰糕点). 26. hot chocolate: a beverage made by mixing powdered chocolate with water or milk and usually heated and consumed in cold weather. 27. Dutch donuts: a round pastry with a hole in the center, cooked in hot oil and usually frosted with sugar (荷兰面圈，一种外面有一层糖霜的油炸面圈). 28. parade: a formal procession, usually well organized of people wishing to celebrate some important event (一种庆祝游行). 29. float: a decorative structure on wheels (彩车). 30. costumes: clothes that are typical of a particular place or period of time in the past (某地或某时期的典型服装). 32. cancelled: deleted from a schedule, omitted, struck out or removed. 33. march: walk in a rhythm or pattern as in a parade or well organized procession (游行，行进). 34. pastries: sweet baked goods, often flavored with sweet coverings or fruit, and frequently eaten with coffee or tea (甜糕点，上面常常有一层甜的东西或水果，经常与咖啡或茶一起吃). 35. pottery windmill: a small replica of a windmill made of clay and glazed before heating to harden the clay and glaze (做纪念品用的小陶瓷风车房). 36. Pella Opera House: a building constructed in the late 19th century in Pella, Iowa, where the Dutch had settled and built a small town (派拉剧院，于19世纪晚期建在爱荷华州的派拉，派拉是荷兰人建立的小城镇，是他们的定居地。). It was recently renovated and serves as a place for performing musical and dramatic events for residents and tourists. 37. announced: said out loud, or voiced something (宣布). 38. good deed: an act of kindness or generosity; something done for another person without expecting pay for doing it (好事，善事). The sky here in McCall is so smoke-filled this morning that we can’t see the mountains on the East side of the valley1. Usually2 I enjoy seeing the early morning sunrise3 and its colors on the mountains, but this morning it isn’t possible. The smoke, of course, is due to the forest fires that are burning on nearby mountains. The fires are in wilderness4 areas, where the forestry service5 doesn’t try to send in fire fighters unless some homes or tiny villages are in danger. There are some fire retardants6 and water dumped7 on the areas, but the fires keep spreading and the smoke keeps building up and descending into the valley8. It has an acrid9 smell and it is irritating10 to one’s eyes and lungs11. Consequently12, I don’t mind it that we are leaving to return to our home in Iowa in a few days. Our little paradise13 here has just too much smoke for comfort. Iowa is not a perfect place either. It will probably be hot and humid14 during the next month or so. There is also the chance of tornadoes15 in the spring and summer. We waited in our basement16 earlier this summer as a tornado passed over our town. Also there will be snow and ice storms this winter. However, I know that on our coastal17 areas of the U.S. people are hoping that there will be no hurricanes18 this late summer and early fall (hurricane season). Many Midwesterners19, including Iowans, think that they would like to move to California or Florida for their wonderful climate. However, those areas are not perfect places either. There is the constant fear of earthquakes20 in California and hurricanes in Florida, and recently there have been both forest and grass fires that have destroyed many homes and even a few small towns. I really hate to see the beautiful forests destroyed here in the mountains. I also hate to hear of the flooding21 in Texas and Oklahoma. Realistically22 there can be no perfect place to live because weather extremes23, floods, tornadoes, fires, hurricanes, earthquakes, etc. occur all over the world, so people everywhere have to learn to value24 the positive aspects25 of wherever they are and to cherish26 them, just as I cherish the forests and mountains of Idaho and the green cornfields and rolling countryside of Iowa. 2. usually: in most cases; the most common; normally (通常). 3. sunrise: the time of day in early morning when the sun appears on the horizon. 5. forestry service: a governmental agency which oversees the forested areas in the U.S. (林业局). 7. dumped: dropped from an areas above; in this case in containers suspended or carried in airplanes or helicopters (投放，倾洒). 10. irritating: causing discomfort to the skin or other part of the exposed body (有刺激的，引起疼痛的). 13. paradise: a place highly desired by a person; heavenly place; a place of delight (天堂，令人向往的地方). 14. humid: a weather situation in which there is a high level of moisture in the air (潮湿的). 15. tornadoes: violent storms over land, characterized by funnel shaped winds, capable of damaging property or life (龙卷风). 16. basement: the lower part of the house; underground level, dug into the soil (地下室). 17. coastal: in areas along the oceans or seas (沿海的). 18. hurricanes: strong winds arising in the oceans and capable of moving onto land to produce damage either by straight force winds, or by tornado-like winds (飓风). 20. earthquakes: geological events in which cracks form in the Earth’s surface causing possible damage and shaking of the adjacent land (地震). 23. extremes: the higher and lower limits of some weather conditions, i.e. temperature, storms, rainfall, etc. (极度状况). 24. value: appreciate or assign positive worth to something (珍重，看重). 25. positive aspects: qualities which are desirables or good in a given situation (好的方面). 26. cherish: hold as important and good for oneself and others (珍爱，珍惜). There is an interstate highway1 that is commonly referred to as the Main Street U.S.A.2 because it stretches from New York, New York, and the Atlantic Ocean to San Francisco, California, and the Pacific Ocean3. It is the busiest interstate in the nation. Officially it is known as Interstate 804. It was built along what was once known as the Lincoln Highway5, in honor of President Abraham Lincoln6. As one travels across the U.S. on I-80, one gets a good cross section7 of the variety of Scenery one can find in the U.S8. Starting in the heavily populated9 and congested10 area of New York and New Jersey, the traveler soon gets into the rolling hills11 and mountains of Pennsylvania, with its big, well tended12 Amish13 farms. This type of scenery continues on through Ohio and Indiana, but the road becomes congested and busier as the traveler passes by Chicago in northern Illinois. The truck traffic is especially heavy14 because Chicago is an important business hub15. On west of Chicago one again enjoys the scenery of the rich agricultural lands16 and then crosses17 the majestic18 Mississippi River19 into Iowa. Since Iowa is the number one corn producing state20 in the nation, one sees vast21 fields of corn during the growing season. This continues into Nebraska, but as one gets further west and the climate22 is drier, one sees cattle grazing23 on the grasslands there. As one leaves Nebraska and enters Wyoming, the beautiful Rocky Mountains24 appear. At one rest area25 there is a huge statue26 of Abraham Lincoln, reminding the traveler that this highway is also the Lincoln Highway. From here on one sees mountains and desert as one travels through Utah, Nevada and into California with its pine forests. One highlight27 of the trip in Utah is the Great Salt Lake28, the largest body of salt water on our continent29. As one leaves the forested mountains of California30 and heads into the heavily populated areas, traffic becomes very heavy again, but when one arrives in San Francisco, one is rewarded by the sight of the beautiful Golden Gate Bridge and the blue water of the Pacific Ocean31. This blog is being written from our vacation home32 in the mountains in Idaho. We traveled on Interstate 80 from our area in Iowa to the Salt Lake City area before heading north into Idaho, and once again we were reminded of the varied beauty33 of our country. We recommend this road trip34 to anyone who can take it. 2. Mainstreet U.S.A.: the primary or busiest street (美国最重要最繁忙的道路). 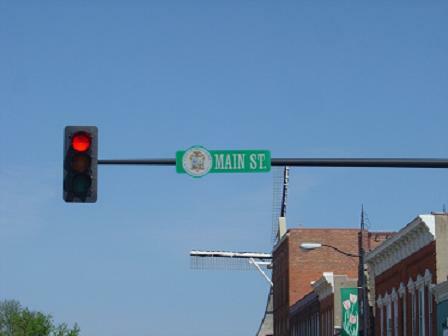 Most cities have a mainstreet as a result of having been located on or near a highway. Because this interstate highway passes completely across the U.S. it is thought of as a mainstreet of our country. 4. 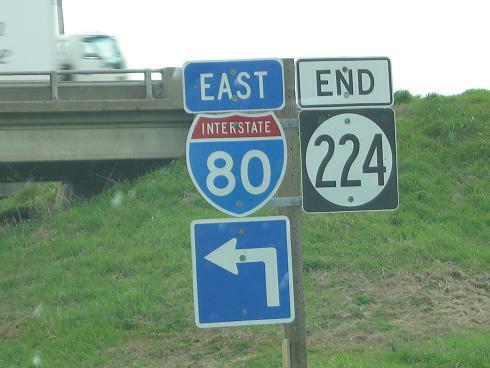 Interstate 80: 80号州际公路，常用I-80表示。In the U.S., most interstates which run East/West have even numbers, i.e. I-80, I-90 etc., and those going North/South are given odd numbers, ie. I 1 in California, I-35 from Minnesota to southern Texas etc. 5. Lincoln Highway: the name given initially to Highway #30 in honor of President Abraham Lincoln. I-80 travels mostly on the same path as did highway #30. 6. Abraham Lincoln (亚伯拉罕•林肯): the 16th President of the United States who is honored as the leader of the country who opposed slavery and brought important social and physical changes in the U.S. He was from the state of Illinois, and he promoted construction of many highway and railroad projects in his attempt to develop the western part of the U.S.
7. cross section: a cut or view extending across a large area or object; a typical selection of the various aspects of that area or object (剖面，有代表性的人或物). 9. populated: heavily represented by having many people in an area (人口稠密的). 10. congested: full of traffic (交通拥挤的). 11. rolling hills: a series of rounded, raised land forms, one after another (延绵起伏的山丘). 12. well tended: kept in excellent condition, appearing tidy and attractive (精心照料的). 13. Amish: of a group of people who live simply, particularly in rural areas; and who were immigrants from Germany, mostly in the 18th century (阿米什人，阿米什人的). 14. The truck traffic is especially heavy: 货车运输特别繁忙。. 15. business hub: the central and most important part of business in the area (商业中心). 16. rich agricultural lands: fertile soil, useful for growing crops on a commercial or individual basis. 17. crosses (横跨): In this case, the Mississippi River is crossed by a long bridge as a part of I-80. 20. number one corn producing state: the state in the U.S. where the most corn is grown in a given year (生产玉米大州). 21. vast: great in size, extent or range; enormous. 23. grazing: (cattle or sheep) slowly eating grass in a pasture. 24. grasslands n. an extensive area where grasses are the primary plants growing naturally. 25. Rocky Mountains: the name of a high mountain range extending from Alaska south into Mexico (落基山脉，它北起阿拉斯加，南至墨西哥). 26. rest area: a facility located along a highway where passengers may stop to find restrooms, water and a safe place to rest from travel for shorter periods of time (高速公路上供过往旅客休息的服务区). 31. forested mountains of California: tree covered high mountains; i.e. Rocky Mountains. 33. vacation home: a second home, usually located in a desirable area where it is possible to relax and engage in recreational activities (第二个家，通常位于自己喜欢的地方，是休闲度假的去处). It’s good to be home again! Don and I had a wonderful trip to China, where Hangzhou seems like a second home to us. We’ve lost count of the times1 we have visited there, but we think this was trip number 18. We have a wonderful, warm circle of friends2 there, but there are also things that make our home in Iowa especially welcome again– our king-size bed3 that is long enough for Don’s two meter height, our daughter Kim with her cheery laugh, and, of course, our big, faithful black labrador dog, Blitzen. According to Kim, Blitzen missed us terribly4 while we were away, but probably no more than we missed her. At the moment she’s close by, looking out the door at the birds, squirrels5 and occasional cat in our back yard. It’s no coincidence20 that the Sunday after Thanksgiving is the busiest travel day of the year in the U.S. People may have gone home on Tuesday, Wednesday or even early Thursday morning, but almost everyone has to be back to work or school the following Monday, so the airports are jammed21 and the highways crowded. I’m glad we will already be home! 1. have lost count of the times: have forgotten how many times something has occurred (记不得有多少次了). 2. a …circle of friends: a group of close friends. 3. king size bed: a bed which is very large, both longer and wider than normal (特大号床). 6. Thanksgiving Day (感恩节): the fourth Thursday in November, a day when families get together for a large meal in memory of the historical event at which British settlers and Native Americans feasted together in friendship. 7. turkey (火鸡): a large, native bird in the U.S. which has been domesticated, and is now part of the traditional Thanksgiving dinner. 8. brunches: meals which are served about mid-way between breakfast and lunch (早午餐). 9. announced: stated or said. 10. super market: a large store which sells all sorts of food and items to be used in the home. 11. thawing: the melting of frozen items (化冻). 12. bread dressing: (AmE.) a mixture of bread, onions and spices prepared along with chopped internal organs of the turkey; dressing here means stuffing (指填入火鸡肚子里的面包等填充物). 13. green bean casserole: a dish prepared with green beans, mushroom soup and onions, probably the favorite vegetable dish in the U.S. (由绿豆、蘑菇汤、洋葱等做成的砂锅，颇受美国人喜欢). 14. escalloped potatoes: potatoes sliced, with a sauce and baked in an oven (烤土豆片). 15. cranberry and pineapple jello salad: a mixture of gelatin, pineapple, and cranberries (越橘、菠萝和果冻做成的沙拉). 19. “never again”: an idiom meaning I hope never to cook a turkey that large in the future. 20. coincidence: an occurrence of two or more events that occur at the same time and seem to have some connection, but actually are independent events (巧合). 21. jammed: so crowded as to be unable to move easily, full of people. Maxine and I have had several trips to China when we’ve had to rush to make connections1 between scheduled flights, and we’ve even missed connections a couple of times. This time, as we travelled to Hanghzhou for the Chinese New Year and meetings with our colleagues, we had the novel2 experience of racing in wheelchairs to catch our flight from Chicago O’Hare to Shanghai Pudong. The trip started innocently enough3. We had arranged for electronic tickets4, roundtrip from Des Moines to Shanghai. Because the weather was blustery5 and snowy in Iowa, we elected to stay overnight in a motel near the Des Moines airport rather than to make the trip from Pella to Des Moines on possibly icy roads in the early morning. Kim and Blitzen drove us to Des Moines the day before, had a lunch with us, and then dropped us at our motel. We woke at about 5:00am, dressed, and took the courtesy bus6 to the Des Moines airport, arriving two hours ahead of our flight time as required for our overseas flights. Our luggage – which we’d carefully packed to meet weight limits – checked through ok, and we passed through the security check without incident, then walked leisurely to Gate A-57 for our United Airlines flight to Chicago. About 10 minutes before scheduled flight time, we heard our names announced8, informing us to report to the United9 clerk at the gate. We were told that our plane was delayed to Chicago so we could not leave Des Moines by United in time to make our connection to the United flight U835 to Shanghai. However, United was able to contact American Airlines and secure10 seats on flight #1109 which was departing for Chicago in a few minutes, and which would allow us to make our O’Hare connections on United U835 to Shanghai. That seemed fair enough, and we were informed that our luggage would be taken over to the American Airlines flight and checked through to Shanghai as usual. They issued another set of luggage tags for us, so I now had one set from United, and another from American. O.K., no problem, so we lugged11 our carry-on bags12 down the corridor to American Airlines Gate #5A, received our seat assignments on the American Airlines flight to Chicago O’Hare, and congratulated ourselves at having been lucky. We had a nice trip to Chicago, circled a bit near O’Hare to account for the slight delay due to snowy weather, and we prepared to leave American Airlines to catch our United flight U835 to Shanghai. As we departed the plane, the friendly, helpful flight attendant looked at our tickets and told us that “the flight to Shanghai” would leave from Gate K29. Noting that Maxine was limping13 a bit as we exited the ramp14, the friendly attendant suggested that we arrange for a wheel chair for her for our trip to Gate K29, about 10 minutes from our arrival gate. Well, that was nice, and a rather small young woman with a comfortable wheel chair helped Maxine into the wheelchair, and off we headed for the Shanghai flight. We chatted with the young wheelchair pusher15, and arrived at Gate K29 just as boarding began for the flight to Shanghai. Another wheelchair with pusher was instantly at hand, and we were off on our race of the day. The fellow who had my chair was stronger and faster, so he took the lead16, weaving17 in and out of traffic at full trot18, into elevators, up, then down again, dashing19 down corridors, and trying to see United’s departure screens20 to verify that Gate C9 was the correct destination. I shouted at people in our way, “Coming through, look out, gangway21,” and other appropriate verbal warnings22 to those who did not see us rushing along in our race to Gate C9. People parted like the Red Sea for the Israelites23 without a single collision24. (Let it be known that United Gate C9 is about as far from American Airlines K29 as is possible in this mammoth25 airport!) We didn’t have a stopwatch26 on the trip, but it was at least a 10 minute dash, leaving our young wheelchair pushers tired and breathless, but proud of their performance. We paid our pushers well for their efforts, and, boarding our flight U835, we collapsed gratefully in our assigned business class seats27, well started on our way to Shanghai. Things went well again, the trip was uneventful with comfortable seating, too much food, ample snacks, and a flight just about an hour later than scheduled. Our luggage arrived on the United carousel28 – not on the American Airlines. Immigration and customs clearances went smoothly29, and we pushed our luggage cart to the arrival gate, greeted Li Shumin and Jiang Jingyang and our driver for the trip to Hangzhou30. The driver brought the minivan31 to pick up the luggage, and we left the airport, noticing the heavy traffic as we moved from the airport onto the highway. There was a mixture of sleet32 and snow, lots of slush33 on the pavement, and our driver began his skilled demonstration of switching lanes34, dodging35 other cars, busses and trucks, and moving as fast as the flow of traffic36 would allow. He knew what he was doing, and we were off to Hangzhou, though the heavy traffic and icy roads required more than an hour before we left Shanghai. We continued to talk, contact our friends37 by cell phones now and then, eat snacks and drink water as we traveled. It was more than four hours later when we reached the service area when the driver asked whether we needed a rest stop – we really did38, though we hadn’t thought much about it. Everyone in the car bobbed, weaved and shoved39 through crowds to the restroom areas, more than glad to have the break. We dispatched our errands40, quickly returned to the van and headed toward Hangzhou. The first exit to Hangzhou41 would have been the first choice for the driver, but as we approached the exit area it was evident that many cars and trucks were stuck in the snow and ice on the slight incline that led into Hangzhou on that exit ramp14. We continued on to the next exit which was more nearly level, and entered Hangzhou with little difficulty. Throughout the trip from Shanghai we had mixed snow and rain, some fog, and a temperature that stayed at about the freezing point. The driver wove42 his way through icy, slushy streets43 along landmarks that looked familiar to us from previous trips, but with a blanket of about a foot of snow44. It felt good to be in our “second home45” again even though it was the first heavy snow we had ever seen here. We arrived at the Zhejiang University Science Park46 hotel at about 10:00pm where we found He, Ying, and Haihong in their overcoats in our room, waiting for us, but insistent that they leave immediately and let us get ready for a sleep. We agreed that was a good idea. It had been a long travel day of about 30 hours since we started from Des Moines, and despite the comfortable accommodations we were tired, and grateful for the welcome sleep in Hangzhou. 1. connections: the correct changes from one part of a trip to another by going to the correct gate and presenting a boarding pass and ticket for the next part of the trip (在机场转机). 2. novel: new or unusual (新奇的，不同寻常的). 4. electronic tickets: computer generated proof of purchase of a ticket (电子机票). 5. blustery: windy and stormy (狂风大作的). 6. courtesy bus: a bus or van furnished by a hotel or motel which delivers passengers from the hotel to the airport departure area at no cost to the passenger (旅馆的免费班车). 9. United: United Airlines (美国联合航空公司). 10. secure: get or achieve something (获得，弄到). 11. lugged: pull or carry something heavy with difficulty (用力拖、拉、搬运). 13. limping: walking with the favoring of one leg and a noticeable difficulty (一拐一拐地走). 16. took the lead: be the first to start doing something or be most active in doing something (带头). 17. weaving: moving first to the right, then to the left around other people when moving more rapidly than most walkers (迂回行进，穿行). 18. at full trot: at a pace faster than normal walking, but not running at full speed (以疾走的速度). 19. dashing: going or running somewhere very quickly (猛冲，飞奔). 21. “Coming through, look out, gangway”: slang expressions in English which mean get out of the way, or watch out to avoid a collision with another person or persons (闪开，留神，让路). 23. parted like the Red Sea for the Israelites: a metaphor from a biblical story in the Old Testament of the Bible which states that the Israelites who, when they were pursued by their enemies, came to the Red Sea, and God miraculously parted the waters of the sea to allow the Israelites to pass through safely; then caused the water to return to prevent pursuit by the enemies (像红海为希伯来人分开一样。这是出自于圣经的典故：据《圣经》的《旧约全书》记载，希伯来人受到敌人的追赶来到红海边，上帝奇迹般地把海水分开，让希伯来人安全通过，然后又让海水退回以阻止敌人的追踪。). 25. mammoth: very large (巨大的，庞大的). 26. stopwatch: a watch especially adapted for timing races (比赛用的跑表). 28. carousel: the moving belt that you collect your bags from at an airport (机场提取行李的传送带). 34. switching lanes: moving from one lane of the street or highway to another to facilitate forward progress in congested traffic (换车道). 35. dodging: avoiding something or someone by moving quickly (闪开，躲开). 39. bobbed, weaved and shoved: move quickly one way, then another, and gently shoving other people, and working one’s way (into the restroom areas) (一会儿朝这边走一会儿朝那边走，急急忙忙，推推搡搡地前进). 40. dispatched our errands: took care of our needs and business (处理掉该做的事情). This past week Don and I attended a funeral1. As we sat there, I couldn’t help thinking about how funerals have changed over the years. It used to be that everything seemed designed2 to be very mournful3. Everyone dressed in black, there was a long, solemn4 sermon5, and the music was of a sad type. The funeral we attended last week was quite different and was typical of change. Instead of black dresses or suits. most women had on6 their spring clothes in bright colors, pastels7 etc. That included the family of the deceased8. Mart, the person whose funeral we attended, was 95 years old when he died. He was always known for his quick sense of humor9 and his love of good music. Consequently10, his family wanted his funeral to be a celebration11 of his life and not mournful. There was no sermon. Instead, one son and two grandsons spoke about what he had meant to them as they were growing up, and there was humor in the things they recounted12. The organ music13 was some of Bach’s best14 and was of a celebratory nature15. We all felt uplifted16 by it. The church choir17 also sang, his request, as he had been a member of it for many years. He had a beautiful voice and loved to sing. His grandson told of how he was singing in the hospital the morning he died. We all left the funeral feeling the service had been a true celebration of Mart’s life. I never felt that way when I went to funerals when I was younger. Yesterday the college choir gave its spring concert18. It was at the church too because of the good organ there. At one point the choir director said that they were dedicating19 the next song to Mart, who had been a member of the choir when he was in college over 70 years ago. After the concert several of us told the director20 how glad we were that he had done that. He said he did it for several reasons, the most important being that he thinks that young people these days need to remember that they are a part of something that has had continuity21 for a very long time. I heartily22 agreed. 1. funeral: a ceremony or observance held for a person who has just died, usually before burial or cremation (葬礼). 2. designed: planned and prepared. 4. solemn: serious, somber or gloomy in tone (严肃、庄重的). 5. sermon: a religious speech delivered in public as part of a religious service (讲道). 6. had on: 穿着，“have a piece of clothing on” or “have on a piece of clothing” 表示 “wear a piece of clothing”. 8. deceased: a particular person (or particular people) who has/have recently died (死者). 9. sense of humor: a personality trait or ability to find things amusing rather than being serious all the time (幽默感). 10. consequently: as a result of something or some action (结果). 11. celebration: an occasion for festive or joyful observance in honor of something or somebody (庆祝). 13. organ music: melodic sounds produced by a large instrument known as a pipe organ (管风琴音乐). Most large churches in Europe and the U.S. have pipe organs which are played for church services, funerals, or other occasions. 14. Bach’s best: the best of the music composed by Johann Sebastian Bach (约翰. 塞巴司蒂安.巴赫所谱写的音乐中最好的). He lived in Germany (1685-1750). He was a composer and musician. Some consider his music the best ever written for the organ. 16. felt uplifted: felt very cheerful and happy (感到精神振奋). 17. church choir: a vocal group of persons in a church who regularly sing at services in the church (教堂唱诗班). 18. spring concert: a performance given in spring by a musical group (春季音乐会). 19. dedicating: performing in honor of somebody or something (把……奉献给……). Our little town of Pella1 was established and settled2 by one hundred families from Holland in 1848. These Dutch immigrants3 were seeking religious freedom4; many of them had been arrested5 and imprisoned6 in Holland7 because of having different religious beliefs from those of the state church8. Iowa was being settled by a number of ethnic groups9 from Europe, such as Germans10, who established what are known as the Amana colonies11, and Czechs12 who came to the area now known as Cedar Rapids13. There are also Norwegian14, Danish15 and Belgian16 settlements17. All of these ethnic groups still honor their heritage18 today in different ways. 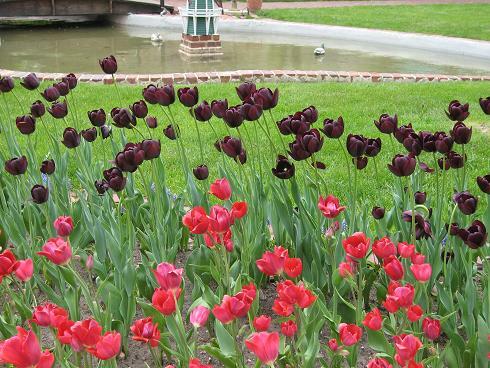 Pella has its annual Tulip19 Time20 to share the Dutch love of tulips with anyone who wants to come to town during the first week end in May. 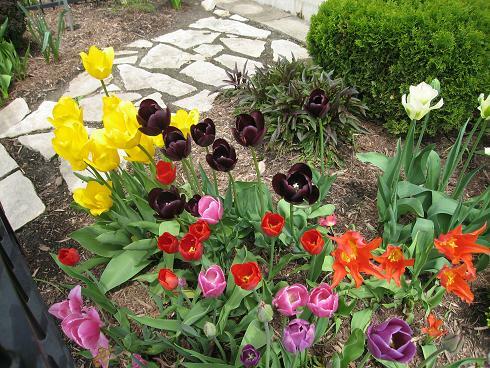 There are five large tulip gardens and countless other small gardens in our town and the streets are also lined with the tulips that the city and the home owners plant. Large tour buses21 come to town filled with people wanting to see the gardens as well as the daily parades22. The elementary schools are dismissed23 on the Thursday and Friday of Tulip Time in order that all of the children, dressed in traditional Dutch costumes24, can march25. They also perform Dutch dances and songs. There are two parades each day. complete with floats26 and marching bands27. The night parade is especially pretty, as the floats are lighted. People also come to Pella for the Dutch foods—traditional Dutch pastries28, sandwiches etc. Each year our whole family eagerly buys and eats the almond pastries29, tiny pancakes30, sausage sandwiches31 etc., which are available from food stands. Delicious! Don, Yuan Jing (our teacher from Zheda for this year, looking very nice in a Dutch costume), and I sold home-made pastries and coffee at a college booth32 on Saturday. We worked for 3 ½ hours and were busy the whole time. Don made and poured coffee. Yuan Jing and I sold pastries. After our shift33 ended, we went to another booth and bought pofferjes, tiny Dutch pancakes served with strawberries and whipped cream. Yuan Jing liked them so much that she went back in the evening and bought more. Our daughter Kim helped make and sell pofferjes, and the earnings34 went to help the college choir. She said they were really busy too. Another Tulip Time has ended. We’re all glad we had good weather on Saturday because Thursday was a cold and rainy day with Friday not being much better. 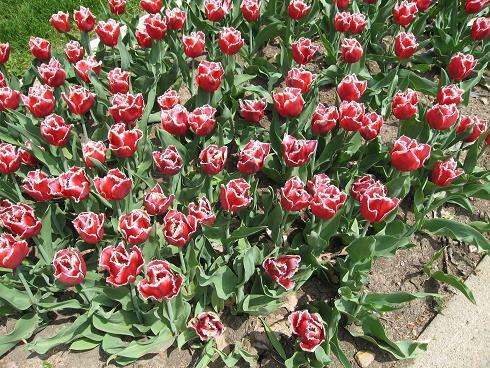 I always feel sorry for people who come to see the tulips, the parades etc., only to be disappointed. On Saturday we talked with people from France and from Shanghai. I hope they had a good time. 1. Pella: a small town in south central Iowa (爱荷华州). The name Pella means “City of Refuge (庇护所、避难城)” and it comes from an ancient town in Macedonia (马其顿) where people fleeing persecution were safe from harm. 3. immigrants: people newly arrived from another foreign country (移民). 4. religious freedom (宗教自由): the ability of one to practice their chosen religion without fear of persecution. 7. Holland: The Netherlands, a country in north western Europe (荷兰，欧洲西北部国家). 8. state church: an official church under government control. 9. ethnic groups: people having common racial or national origin or background (不同种族、民族的人群). 11.Amana Colonies: a group of small towns in north eastern Iowa, settled in the 1800s as a communal society (群居、部落社会). 12.Czechs: people from Czechoslovakia in Europe (来自于欧洲捷克司拉伐克的捷克人). 13.Cedar Rapids: a city in north east Iowa (爱荷华州东北部城市). 14. Norwegian: (of) a person from the country of Norway [挪威人（的）]. 15. Danish: (of) a person from the country of Denmark [丹麦人（的）]. 16. Belgian: (of) a person from Belgium [比利时人（的）]. 17. settlements: newly established place or region (新建的居民点、居住地). 18. their heritage: their cultural or ethnic background or birth (他们的文化种族背景). 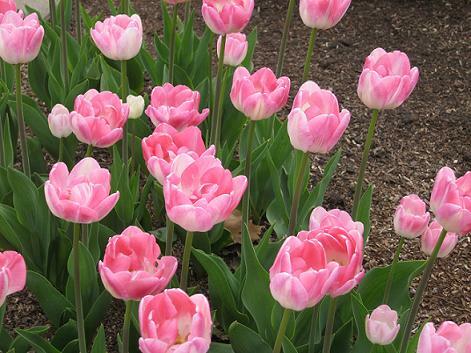 19. tulips (郁金香): a showy flower growing in spring from a bulb, with long narrow leaves, in the lily family. 20. 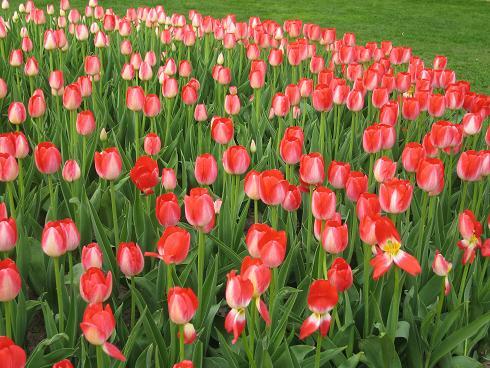 Tulip Time: an annual festival in Pella celebrated the first weekend in May (郁金香节，每年五月的第一个周末在派拉举行); a time when tulips are blooming and thousands of tulip beds are on display in the city. 21. tour buses: large passenger vehicles for tourists (游客乘坐的大客车). 22. parades: a procession of people or vehicles, marching along streets or roads in order to celebrate an important event or day (花车游行). 25. march: move along steadily with a rhythmic stride and in step with others (步伐一致有节奏地行进). 26. floats: wagons with extensive decorations in celebration of an event (花车). 27. marching bands: musical groups representing towns or schools, or countries in a parade, playing music as they progress (游行队伍中的乐队). 28. Dutch pasteries: cookies, pies and other baked items typical of Dutch bakeries (荷兰风味的糕点). 29. almond pasteries: baked goods with flavoring of almond nuts or almond paste (有杏仁味的糕点). 30. pancakes: a flat cake made of thin batter and cooked on both sides (用面粉、鸡蛋、牛奶和起来的稀面做成的薄煎饼). 31. sausage sandwiches: a highly seasoned meat placed within a bread bun (用经过调味的肉做的三明治). 32. booth: a small, temporary building from which items may be sold (用来临时卖东西的小屋). 33. shift: a work period, usually a number of hours (工作时间，通常数小时). 34. earnings: money received for a product or work (挣钱). The other day I wrote about the retirement party1 Don and I attended. It was a very nice party, appreciated by all. Don and I had attended another retirement party in January. This one was held for George Ann, the director of Central College’s Yucatan2 program3 for many years. Since Don and I taught in the Yucatan Study program3 many times and consider George Ann one of our good friends, we wanted to go, help her celebrate4, and see old friends again. The parties were similar in that both had attendees5 that wished the retirees6 well. However, many more people attended the party in Yucatan. Whereas about 60 people were invited (the same number as at the U.S. party), there were about 300 people there. As people in Merida7 heard about the party, they decided they wanted to come too and knew that they would be welcome. The college house was packed full of people, the patios8 were full, and the yard too. The person in charge of the party, being Yucatecan9, knew there would be more than had been invited so she saw to it that there was plenty of food and drink. The food (wine and little open faced sandwiches10) was all purchased on a college budget11 and catered12 in; in contrast, the food at the Iowa party was brought by the faculty friends who hosted13 the party and reflected14 different tastes15. At the Yucatan party, there was much hugging16 (ABRAZOS as the hugs are called in Spanish), even though people might have already seen each other that day. There was also a group of musicians strolling17 around the rooms and yards, playing and singing typical Mexican songs. That is an important and expected part of a Mexican party, one that I thoroughly enjoy. In contrast18, we had no music at the Iowa party. The Iowa party started at 6:30 PM and most of the people came at around19 that time; the Merida party stared at 8:00 PM, with many people arriving much later. We left both parties at about the same time around 10:00. Most of the people were probably gone by 11:00 at the Iowa party; on the other hand, George Ann told us the next day that many stayed until 2:00 AM at her party, a typical20 hour for a party ending there. Both parties were really typical of their representative18 cultures. 1. retirement party n. a celebration held in honor of a person who is leaving work, or will soon stop working (为即将退休的人举办的聚会). 2. Yucatan: one of the 40 states in Mexico and a peninsula in southeast Mexico (墨西哥的一个州，也是墨西哥东南部的一个半岛). 3. Yucatan (Study) program: a study abroad program administered by Central College, Pella, Iowa, through the International Studies Office of the college. 4. celebrate: honor somebody or something by festivities which are not a normal part of daily routine (庆祝). 6. retirees: people who have left their career work or job, and who no longer are fully Employed (退休者). 7. Merida: the name of a city in southeast Mexico, the capital city of Yucatan (Yucatan的首府，位于墨西哥的东南部). This city was established by the Spanish after their having settled in this area and defeating the Mayan Indians who previously lived in the area. 8. patios: the inner courtyard open to the sky; a porch without roof, typical of Mexican Architecture (室外闲坐处). 9. Yucatecan: of the people who live in the state of Yucatan in Mexico (Yucatan人). 10. open faced sandwiches n. single slices or pieces of bread with meat, cheese or other foods on top of the bread (一边有面包的三明治). 11. budget: the plan or money provided for a given activity or office of a corporation or institution such as a school, etc. (预算). 12. catered: provided a supply of food, service and drinks which were not prepared in the kitchen of the place where the meal is held (提供酒菜). 13. hosted: provided a place or facilities for an event, function, or party etc. (主办). 14. reflected: brought about a specific or characteristic appearance of somebody or Something (反映了). 16. hugging: hold tightly, especially with one’s arms around the person being greeted (拥抱). 17. strolling: walking slowly and rhythmically in no given pathway through an area or a group of people (悠闲漫步). You are currently browsing the archives for the Travel and Customs category.